Creamy, rich and sweet, bananas are the number one choice for most of us when it comes to picking a fruit. Because of their soft texture and high nutritional value, they are wholeheartedly recommended for consumption. Children adore the soft flavor and mushiness of the fruit, while the elderly enjoy the fact that it can be easily consumed. Athletes and sports lovers in general appreciate bananas for their high potassium content and the energy they deliver, powering up muscles and the heart. Sadly, the demands for this fruit have come to be so high that it is believed producers will not be able to meet them in the near future. So let’s enjoy the wonderful properties and health benefits this sweet, creamy fruit brings while it is still affordable and available. Bananas belong to the genus Musa and are generally classified into two categories: dessert bananas and cooking bananas. The dessert varieties are widely available and are usually consumed raw, as a snack or dessert. Cooking bananas however are starchier and lack the trademark sweetness of regular fruit, which is why it is best to cook them. Interesting fact: did you know that bananas come in a variety of colours such as green, light to deep yellow, red, purple, brown and black? Dessert bananas are by far the preferred variety and a regular consumption can not only prevent, but also help manage and treat a variety of medical conditions. Probably the most important health benefit of bananas comes from the high potassium content of the fruit. With 467 mg of potassium per 100 g, bananas play a vital role in lowering high blood pressure. The fruit are known to reduce the risk of potentially deadly conditions such as atherosclerosis. A study conducted on 40,000 men came to the following conclusions: those who enjoyed a diet rich in potassium as well as magnesium and had an adequate fiber intake showed substantially lower risks of stroke and heart attacks. It may seem hard to grasp that a fruit so many of us take for granted can have such a great impact on our cardiovascular health. But the truth is bananas are nature’s heart pill. Here is how I convinced myself of just how beneficial bananas can be for our heart: one extremely hot day I felt like I was about to faint, my heart beats were irregular which made me awfully scared. I thought maybe it was because I hadn’t eaten much so I ate the only thing I had with me – a (really large) banana. After approximately 10 minutes I started to recover and after experimenting with my diet, I found that whenever I feel like this, I almost immediately recover if I eat a banana. I now eat them almost daily and I must admit it has done wonders for me. In addition to supporting a healthy heart activity, bananas have long been recognized for their antacid effect. Studies on animals suggest that a regular consumption of raw bananas protects the stomach wall and can efficiently prevent bleeding and lessen pain caused by acidity or other symptoms of gastroesophageal reflux. Basically, substances present in bananas activate the cells making up the lining of the stomach which constitute a thick protective mucus barrier that can efficiently protect against stomach acid. Also, specific compounds found in the fruit called protease inhibitors help eliminate bacteria in the stomach known to cause gastric ulcers. Good to know: if you are suffering from gastritis or gastric ulcer, it is recommended that you consume well-ripe bananas. While unripe, green ones may upset your stomach, perfectly ripe, deep-yellow ones are very easy on the stomach. Also, bananas are a great remedy for diarrhea, a condition that causes your body to dehydrate and lose electrolytes. Fortunately, bananas provide a good source of potassium, an electrolyte which efficiently regulates fluid levels in the body. In addition to this, they contain pectin, a soluble fiber that helps normalize bowel movements and is efficient against constipation. Yes, bananas are an excellent remedy for both diarrhea and constipation. Moreover, by means of various mechanisms, bananas can support and optimize calcium absorption and thus contribute to strong, healthy bones. They are a rich source of fructooligosaccharide (FOS), a natural compound with strong prebiotic action that nourishes the good bacteria in our colon. The good bacteria secrete special enzymes that significantly improve our body’s ability to absorb nutrients from food and, at the same time, help protect against bad bacteria. Because of this, bananas are considered colon-friendly fruit and there are studies which suggest regular consumption can reduce the risks of colon cancer. In addition to all of these amazing health benefits, the fruit are also a generous source of vitamins such as vitamins B6, C, pantothenic acid, folate, niacin and riboflavin. While vitamin C is a great immune booster and powerful natural anti-inflammatory, B-group vitamins ensure our body stays energized, which is why bananas are the preferred snack of every sport lover. Just as important, they are a moderate source of other important minerals such as manganese, magnesium and copper. Although it is not recommended to eat them right before going to bed, bananas are a genuine power-snack. 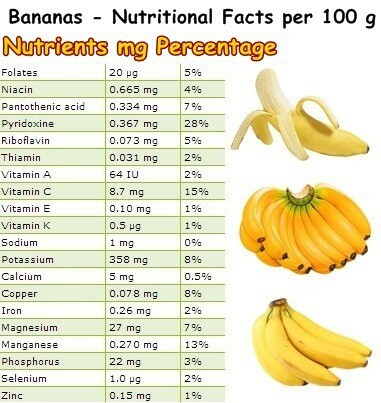 Eating a banana will certainly rise your energy levels and lower your risks of heart disease. Overall, bananas are incredibly healthy and it would be a real shame not to include them in your diet, especially when they are this delicious.